In the Scientific Family Chironomidae we have represented Midges with over 100 genera and possibly over 2000 individual species in North America. This is probably the most widely adapted and distributed group of aquatic insects we have a very important trout food. Midge larva and pupa stages are more imitated by tiers than is the adult stage, however there are a good number of patterns listed in the library. Adult Midge patterns are some of the smallest dry flies that are tied with many recipes in our library specifying hooks all the way down to sizes 26 and 28. Tiemco currently manufactures a micro dry fly hook their number TMC518 in sizes 28, 30 and 32. Most recipes for these ultra small dry fly patterns use the working thread as the body material. There are some vices that are better than others for tying with hooks this small; be sure and test a vice before you buy it if you intend to tie midges. Also magnifying glass attachments are available as accessories to your vice to increase your effectiveness on tying with these micro hooks. Adams Midge Pattern Recipe: Hook- TMC101 sizes 18-26, Thread- Gray 8/0 nylon, Tail- Brown and grizzly hackle barbs, Body- Natural muskrat fur dubbing, Hackle- Brown and grizzly mixed and wrapped collar style. Black Herl Midge Pattern Recipe: Hook- TMC101 sizes 20-28, Thread- Black 8/0 nylon, Tail- Black hackle barbs equal to overall hook length, Body- Black ostrich herl palmered over shank from bend to just before eye. Pattern Designer: Ed Koch. Black Midge Pattern Recipe: Hook- TMC101 sizes 18-26, Thread- Black 8/0 nylon, Tail- Black hackle barbs equal to overall hook length, Body- Dyed black natural fur dubbing, Hackle- Black wrapped collar style. Brown Herl Midge Pattern Recipe: Hook- TMC101 sizes 20-28, Thread- Brown 8/0 nylon, Tail- Brown hackle barbs equal to overall hook length, Body- Brown ostrich herl palmered over shank from bend to just before eye. Pattern Designer: Ed Koch. Brown Midge Pattern Recipe: Hook- TMC101 sizes 18-26, Thread- Brown 8/0 nylon, Tail- Brown hackle barbs, Body- Natural brown fur dubbing, Hackle- Brown wrapped collar style. Cream Midge Pattern Recipe: Hook- TMC101 sizes 18-26, Thread- Tan 8/0 nylon, Tail- Light Ginger hackle barbs, Body- Dyed cream fur dubbing, Hackle- Light Ginger wrapped collar style. Gray Herl Midge Pattern Recipe: Hook- TMC101 sizes 20-28, Thread- Gray 8/0 nylon, Tail- Blue dun hackle barbs equal to overall hook length, Body- Gray ostrich herl palmered over shank from bend to just before eye. Pattern Designer: Ed Koch. 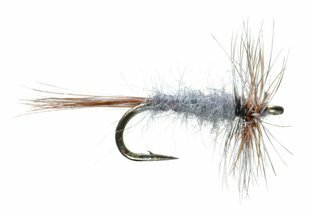 Gray Midge Pattern Recipe: Hook- TMC101 sizes 18-26, Thread- Gray 8/0 nylon, Tail- Blue Dun hackle barbs, Body- Natural Muskrat fur dubbing, Hackle- Blue dun wrapped collar style. Griffith’s Gnat Pattern Recipe: Hook- TMC101 sizes 16-26, Thread- Black 8/0 nylon, Tail- None, Body- Peacock herl, Hackle- Grizzly palmered over entire body. Pattern Designer: George Griffiths. Grizzly Midge Pattern Recipe: Hook- TMC101 sizes 18-26, Thread- Black 8/0 nylon, Tail- Grizzly hackle barbs, Body- Natural Muskrat fur dubbing, Hackle- Grizzly wrapped collar style. Olive Herl Midge Pattern Recipe: Hook- TMC101 sizes 20-28, Thread- Olive 8/0 nylon, Tail- Olive hackle barbs equal to overall hook length, Body- Olive ostrich herl palmered over shank from bend to just before eye. Pattern Designer: Ed Koch. Olive Midge Pattern Recipe: Hook- TMC101 sizes 18-26, Thread- Olive 8/0 nylon, Tail- Blue dun hackle barbs, Body- Dyed olive fur dubbing, Hackle- Brown and grizzly mixed and wrapped collar style.